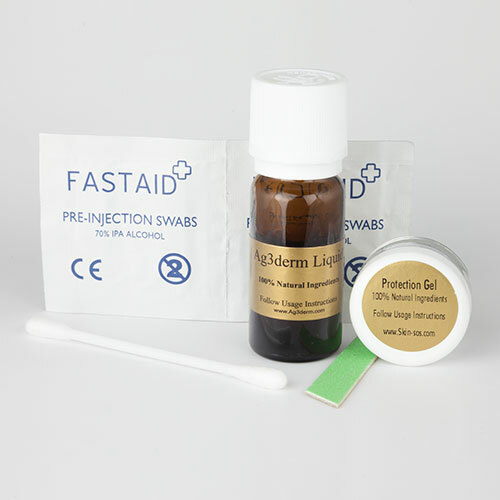 The Ag3derm Pigmentation Kit can treat up to 10 large patches of pigmentation. Ag3derm New & Improved Liquid Formula contains 100% Natural Ingredients which are listed below. What is Pigmentation? Age Spots (also called Sun Spots, Liver Spots or Solar Lentigo) are collections of pigmentation caused by exposure to the sun. They are most common in more mature people or those with frequent sun exposure. The spots commonly appear on the hands but can occur almost anywhere, especially sun exposed areas such as the face, chest, back, arms, feet and shoulders. In addition to sun exposure, simply growing older can cause the extra production of melanin and subsequent age spots, and also forms of keratosis & seborrheic keratosis. Our skin contains ‘melanin pigment’ which absorbs sunlight and helps naturally protect our skin from UV rays. However as we age, our skin’s natural ability to fend off UV rays from the sun begins to deteriorate, and as a result, we see the development of age spots. Genetics also plays a role in how susceptible you are to the development of age spots. What’s the difference between age spots and freckles? Freckles appear when you’re young, they’re more numerous in the summer and they tend to fade with age. All forms of skin hyperpigmentation essentially involve the same mechanism; darkening of the skin due to the over-production of melanin. All of the conditions below can be treated successfully using Ag3derm Liquid Formula. Most people do not experience all of the side effects. It can take 2/3 weeks of applying the solution and 4/6 weeks to finally clear. Results are not permanent, you should avoid the sun and a high SPF sun cream should be used. Wash your hands thoroughly, immediately after applying this product. Use care when applying around the eyes, nose and mouth. Diagnosis of a skin condition should always be determined by a doctor or skin specialist. Application is easy. First you should apply a layer of protection gel to the skin surrounding the pigmentation. Wearing the latex gloves & using the applicator provided, apply the Ag3derm removal solution to the affected area. A mild stinging sensation is normal. You should leave the solution in place for 15 minutes, during which time it will begin to bubble & attack the surface of the pigmentation, leaving a white residue as it dries. Simply rinse with water. You should repeat the treatment twice per day for up to 14 days. More or less treatment may be required depending on the pigmentation. The pigmentation will dry & form a scab which will fall off naturally. You should not pick the scab as it may cause scarring. What is Pigmentation?Age Spots(also called Sun Spots, Liver Spots or Solar Lentigo) are collections of pigmentation caused by exposure to the sun. They are most common in more mature people or those with frequent sun exposure. The spots commonly appear on the hands but can occur almost anywhere, especially sun exposed areas such as the face, chest, back, arms, feet and shoulders. In addition to sun exposure, simply growing older can cause the extra production of melanin and subsequent age spots, and also forms of keratosis & seborrheic keratosis. I had been looking for something that worked for ages. Grateful that I stumbled upon this site. Super Fab product. The age spot on the side of my face has disappeared. This is not a scam. They do not lock you into auto ship or other such non-sense. I am a WM 57 now living in Phoenix AZ. I was raised on Florida’s beaches where I lived/worked as a police office in a beachside town. When I wasn’t working I was out on the beach sunning. I am now paying for it with freckles appeared on my face, head, and neck. A friend gave me her remaining amount of AG3 as it had worked for her. I had a large freckle appear on my right check 2 yrs ago. It has now been 2 weeks and is almost gone with the 1/4 bottle she gave me. I have also tried it on some moles and other blemishes and it WORKED! I am ordering another bottle as of this writing. I bought this solution last year to remove quite a big brown mark on my face, it removed it in just a few days well pleased with this product would defo use it again. I am an Australia customer. This liquid really works. I had lots of little brown spots on my calves and the back of my arms. It sounds petty, but I was getting quite down about these spots, but the product cleared them right off and made me feel youthful again. Only down side is that the liquid did STING quite a bit on application, but I think a five minute “dance around the bathroom” in a bit of pain until the liquid dried on my skin,, was worth the end result. I purchased your product about two weeks ago. I had an age spot about the size of a dime on the left side of my face. It appeared over a year ago. I just want to preface that I tried creams, home remedies and even laser and nothing made a difference. I came across your product looking for age spot removal products. I watched the YouTube videos, not that I believe them all of the time, but I figured why not for $39.00 what do I have to lose? When I received your product I read the directions carefully. When it is applied there is a burning sensation. Obviously that is the product doing its thing. I only applied it for 6 days because the scab had formed. I thought I would stop there and let my skin heal to see if there was any progress because I had plenty more product left to repeat the process once my skin healed. Well needless to say the scab has healed and the mark is gone. I do not have to repeat the process.